As it's September now, and the temperature has dropped enough that jackets and jumpers have become necessary, I consider it to officially be Autumn, a.k.a my favourite season. Along with the change in season comes the desire for a few new things to equip you for the weather to come, and there are a couple of particular items I'm planning on investing in this time around. It's not necessarily this exact coat that I'm after (mainly because I can only buy it online), but I really would love to find a coat in a similar style. Last year I wore my green parka almost every day, and much as I still love it and plan to get plenty of wear out of it again this year, it would be nice to own a slightly smarter coat for those days when I want to feel a little more dressed up, or for when I go out on a chilly autumn evening. I love the look of boyfriend coats in a grey marl or herringbone pattern, and my mission for the next couple of months is to find the perfect one. I featured another Skagen watch in my last wishlist in the summer, and although I never did end up buying it, I'm glad I didn't, as now I have fallen for the white-faced 'Ditte'. Incredibly simple and minimalist, there's something to lovely about this watch, and it would be perfect for every day wear. 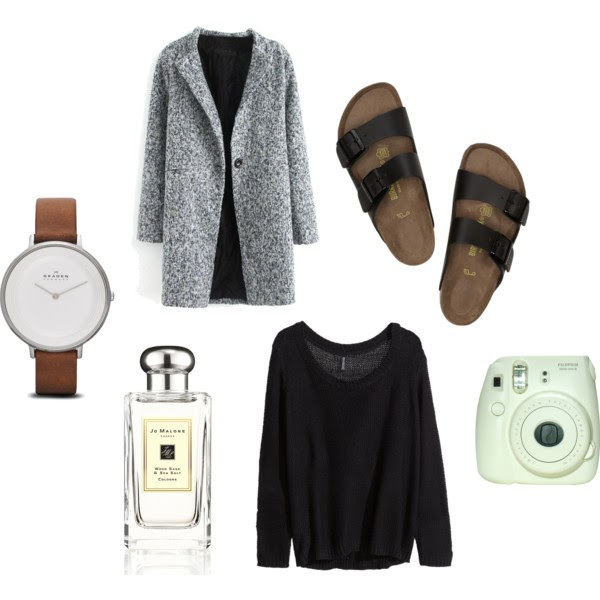 Despite the cooler weather, I am still lusting after a pair of Birkenstocks. It's unlikely that I will be ordering a pair this year, but they may well stay on my wishlist until the weather gets warm enough for them again. Having sniffed this perfume on a friend of mine who works in Jo Malone more than a month ago, before it was released, I have been waiting for it to go on sale ever since. I've yet to try it on my own skin, but it smelled so beautiful on my friend that I've no doubt I won't love it on myself, too. Described as 'Alive with the mineral scent of the rugged cliffs. Mingling with the woody earthiness of sage. Lively, spirited and totally joyful', this is a really lovely, feminine perfume, and I can't wait to try it out, and maybe even pick up a little bottle. I've been wearing a lot of black lately, and I'd really like to get myself a cosy black jumper to snuggle up in as it gets colder outside, and this slouchy number from H&M seems like the perfect one. It would be perfect layered over black skinny jeans, with a pair of white Converses and a big cosy scarf. I've wanted a polaroid camera for a little while now, and whist browsing Polyvore I came across this adorable white Fuji one. If the film isn't too pricey (as it is with a lot of older polaroid cameras), I may well order one or pop it on my Christmas list – not that I'm ready to think about Christmas just yet!